The recent cancellation of a Marvel series has cause a stir in the secondary market for the title’s final issue. Since Marvel launched Mockingbird in March 2016 following Bobbi Morse’s (Adrianne Palicki) exit from ABC’s Agents of Shield, it’s been all downhill for the character in her own regular comic book series. With the book’s plummeting sales and no TV support for the character, the title’s cancellation is not surprising. 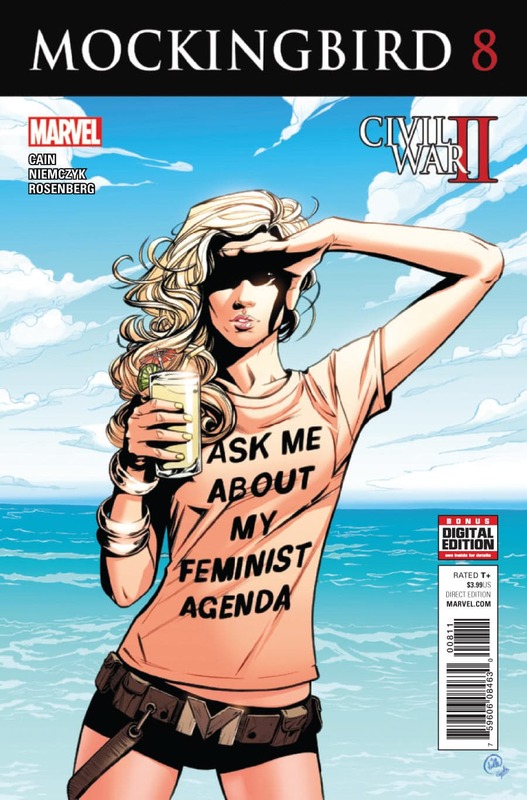 However, following the announcement that series writer Chelsea Cain was shutting her Twitter account due the negative reaction to the character wearing an “Ask Me About My Feminist Agenda” t-shirt on the regular cover of the title, collectors and speculators have taken notice. Secondary market sales of the issue, which was also published in a cosplay variant, are consistent at $10, with only a few sales in the $15-17 range. The only aberration is a reported NM+ copy that sold Oct. 31 from a seller in Canada for $45. Since, the title never sold particularly well, it’s no surprise there are no graded copies in the census. This could change with this issue. In terms of collectability, eBay listings currently range from $7-$25.00. Although the issue was dramatically under ordered by retailers, when the furor dies down, expect sales to cool and the issue to settle in under $10. It’s upsetting it got cancelled, as it it was one of the few Marvel books I actually enjoyed.